Negotiating job offers is an action that employers have grown to nearly expect from their prospective candidates, and one that is not always discouraged. However, there are ways to do so respectfully, and mechanisms to increase your likelihood of success! Remember: You Don’t Need to Disclose! We understand how uncomfortable it may feel to assert that you will not disclose your current salary, but doing so may very easily decrease the final salary you are offered. For instance, imagine you disclose your current pay at a rate thousands of dollars below what the company would have expected to compensate you – that ultimate consequence may impact your spending for years to come! Wait for Confirmation of Salary Range: Make sure not to jump the gun in this situation, and wait to begin negotiating until you have received a solidified salary range from your employer. Maintain Control of the Situation: With 3 easy steps, the Ladder’s Emilie Ares will teach you how to move on from this question in a way that will avoid the awkward atmosphere change – while helping you keep a dominant stance over your negotiation (watch here)! Be Aware of Your Tone: The most enticing reason to offer competitive pay stems from how valuable you appear to your future employer. An enormous component of value is personality and delivery! For that reason, always maintain awareness of how you are initiating negotiating conversations. Do: Sound respectful, aware, excited, willing to meet a compromise, open-minded, and politely assertive. Don’t: Sound greedy, condescending, bossy, or entitled. 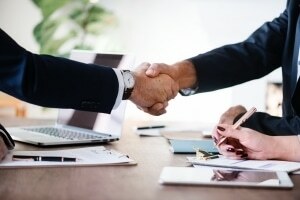 Prepare: Before you initiate a negotiation, you must prepare a mental list of reasons as to why you deserve a higher salary, how your qualifications support your opinion, and how potential experiences or offers have contributed to this decision (make sure not to compare to another company! ie: Well Xcompany is offering __, so I want…). Extra Tip: Especially if you are negotiating other aspects of your job like work hours, explain specific reasons as to why other hours may not work for you. Self-assess, Express Interest and Commitment: Before taking the steps to negotiate, assess yourself to truly evaluate whether you will accept a final offer at the company you are interviewing for. If so, make sure to express interest and commitment to the position! If it appears that you will not accept a higher offer and are not truly interested, your likelihood of achieving negotiation is far lower. For more information… check out Harvard Business Review’s article on “15 Rules for Negotiating a Job Offer”. Searching for a new position? Scroll through our open jobs list! Read through our article to learn exactly why you should not accept a counter offer!